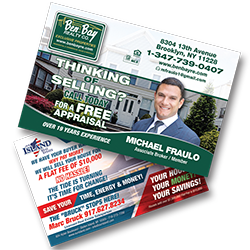 Postcards are one of the most convenient methods for spreading the word about your company and services. They can easily be handed out at a conference, sent via mail, or given to clients for special offers. Postcard sizes vary depending on your needs, but the goal of sharing your important message is always the same. Let Nu-Miracle Press be your main source for postcards. Having a unique image and layout can be the difference between a postcard ending up in a trash can or on a potential customer’s fridge. Our high-quality, beautifully designed Postcards are sure to catch the customer’s eye and stand out from your competition. From design to print, our team will work closely with you every step of the way making the process quick, easy and to your satisfaction. Our skilled designers and printers will present various ideas to meet your budget and design preferences. Our goal is to create an ideal marketing design through a method that is best for you. Nu-Miracle Press skilled graphic designers are on site to help create your one-of-a-kind design. We can customize and match all of your printing material, creating the ultimate professional look. Or, our designers can incorporate our stock photos into your Postcard design to easily coordinate with any of your existing or future marketing materials. You can also upload your own photos and artwork to our website or send via e-mail, which our talented designers will incorporate into your Postcard design. Whichever method you decide is right for you, our team of designers and printers will work hard to create a unique custom design and the perfect Postcard for you. Nu-Miracle Press Postcards come in a variety of sizes depending on your needs. Postcards can be used for business as well as personal uses. A Clear Message: The recipient should not have to open an envelope and dig through a ton of information. Your message should be clear and concise right on the front of the card. Convenient: Postcards are easy to hang up or pass out to remind customers of an upcoming event. Versatile: You can promote a large or small event, or just use a postcard to check in with a client with updated information about your services. Visit our Brooklyn office to see all that we have to offer and be inspired for your next project! WHY CHOOSE NU-MIRACLE PRESS POSTCARDS? Nu-Miracle Press Postcards are glossy, colorful and beautifully designed. Made from high-quality materials, our custom Postcards are made from thick card stock and are UV coated to protect them from moisture, making them durable for mailing and distributing. Nu-Miracle Press Postcards are designed and printed by our professional team. Our talented graphic designers are conveniently on-hand to help you every step of the way. Our skilled printers are working hard, meeting your needs and deadlines to get your quality product completed on time. All this at a reasonable price! Ready to get started with your Nu-Miracle Press Postcards? Contact us for a free and fast quote, or call us for more information.